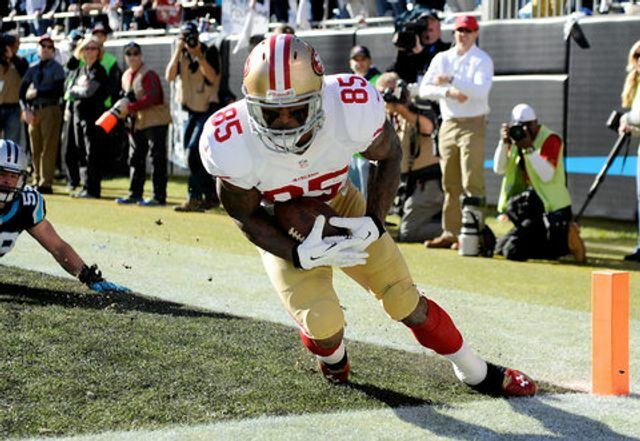 You can now own and trade shares of Vernon Davis' future income. Vernon is showing off his new fiduciary duties by angling for a new contract with the 49ers. Good luck to the Wall Street analyst trying to model out this one. For an athlete who has signed away 10 percent of his future income from playing contracts, corporate endorsements and appearance fees, Mr. Davis seemed at ease. He said he had “no regrets at all.” Mr. Davis received $4 million through the I.P.O., which sold 421,100 shares and raised $4.2 million from investors. The deal implied a $42 million valuation for Mr. Davis’s future income. At a private event at the Fantex headquarters in San Francisco, Mr. Davis received an oversize novelty check for the $4 million, mingling with employees and posing for a picture with Buck French, the company’s co-founder and chief executive. Listening to discussion re Fantex and Vernon Davis. Seems like good deal for Davis, not sure about for investors. Very speculative.